Reki is the Sniper department's ace. Butei rank S. Her real name is unknown. She's habitually taciturn, constantly impassive and indifferent in fashion. She's always seen with a large headphone over her head. Her signature quote is "I am a single bullet. It has no heart. Therefore, it does not think. It just flies straight towards its target", which she always says before she shoots her target. She can shoot anything without missing her target within 2-kilometer radius. Her personal weapon is a Dragunov sniper rifle. She apparently listens to the sound of wind from her homeland using headphones in order to keep her soul intact with it. Reki is descended from Minamoto no Yoshitsune and Gengis Khan, and hails from a tribe in Mongolia, referred to several times as the Ulus. She lived with 46 other females in seclusion. Why she was released and not the others is unknown. 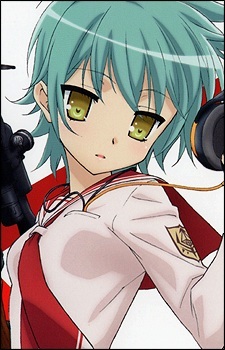 Reki is the Snipe department's prodigy, and her proficiency in the field has been mentioned numerous times in the past. However, due to her skill, she seems to have performed "unrecorded" jobs in other countries, namely Russia and China. "Sweeper" is mentioned by Jeanne, where it is implied that she has actually performed as a Butei assassin.